Dunagiri or Dronagiri as it’s sometimes called is one of the bigger peaks in the Chamoli District of Uttarakhand and is about 8,000 ft. It lies in the ring of peaks surrounding Nanda Devi which is the highest in Uttarakhand. 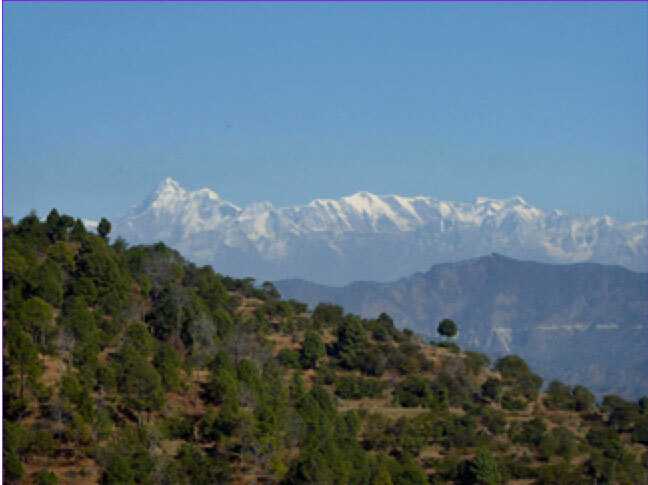 The little town of Dunagiri, nestling in the heart of the Kumaon Himalayas, is a haven of beauty and spirituality. The mountain as well as the village is steeped in ancient lore. The history of the place spans eons (yugas) and not just centuries. Many rishis had lived here in the Vedic age and it is said that some of the Upanishads were heard by the rishis at this very place. In the Puranic age, Guru Drona, the teacher of the Pandavas and the Kauravas in the Mahabharata had done tapas (meditative practices) at this place, hence the name Dronagiri. The great king Bharata, after whom this country got the name of Bharat, is said to have been born at Dunagiri. He was the son of Shakuntala and King Dushyanta. This story has been immortalised by the great poet Kalidasa. At the bottom of the mountain is a cave called Pandukholi which is the place where they stayed for a period of time. It is believed that the Pandavas, the heroes of the famous epic, Mahabharata took shelter at Dunagiri. Dunagiri or Dronagiri is covered with many strange herbs which have been immortalissd in our Puranas. The plant called “Soma” is supposed to be a herb which gives the nectar of immortality. The word “drona” can also be translated as a sort of pot or “container” and “giri” means mountain so the name of the mountain may well be “the mountain which is a ‘container for Soma’”. The story of Rama is also connected with this place. The Ramayana is an epic tale of great love and sacrifice. Rama’s wife, Sita had been abducted by the demon king of Sri Lanka, called Ravana. Rama went to rescue Sita and was helped by certain simians, chief of whom was Hanuman. At one point in the terrible war between Rama and Ravana, a deadly arrow pierced Rama’s brother Lakshmana and he fell into a deep swoon. Hanuman went to the city of Lanka and captured Ravana’s Ayurvedic physician and brought him to the battlefield. He declared that the only thing that could save Lakshmana was the potent herb called Mrita Sanjivani, which literally means” that which can rescue from death”! However this herb could only be found in the high regions of the Himalayas in the mountain called Dronagiri. This was in the very north of India and Sri Lanka was at the very south. The herb had to be administered immediately since Lakhmana’s life was ebbing very fast. It seemed like an impossible task. However nothing was too difficult for Hanuman, whose love for Rama enabled him to overcome all difficulties. He asked the physician to tell him how he could identify the herb. The physician told him that since it was a herb which could bring the light of life to the darkness of death, it had its own light source and would glow like the moon at night. 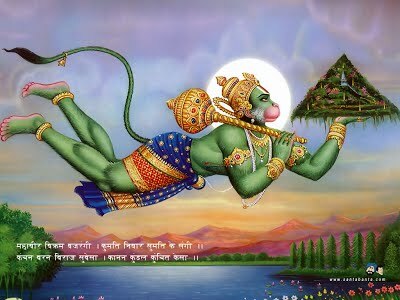 Hanuman, who was the son of the wind god, immediately flew to the mountain that very night. However Ravana heard of this and sent his emissaries to set fire to the whole mountain so that Hanuman would not be able to see the herb. Nothing daunted, Hanuman simply broke off that part of the mountain which was on fire and came back to Sri Lanka. The fire had been put out by the wind as he flew back and the Ayurvedic physician was able to identify the herb which had remained unscathed and was glowing like a jewel. He immediately crushed it and administered it to the dying Lakshmana, who revived and dashed back to the battle with renewed vigour. One can imagine Rama’s delight and his gratitude towards Hanuman. Hanuman carrying the mystic mountain back to Sri Lanka. Actually the mountain does look as if it has been chopped off from a side. It is said that the villagers were very angry with Hanuman for chopping off their mountain and refused to worship him for a long time. But now the herbs have grown back and they have forgiven him and reinstated him in the pantheon of gods! The temple of Dunagiri Devi is about 14 kilometres from Dwarahat where we were staying. The temple is located on a hill top. There were about five hundred stairs to the temple. However we chose to take the path through the jungle rather than by the stairs. It was a beautiful climb through a forest of pine and devatar trees and filled with bushes which were no doubt medicinal. 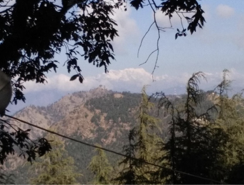 There was a beautiful view of the Himalayan snow peaks from the top of the hill. According to the local tradition, many sages had built their ashrams at this place and meditated on the divine mother. The ashram of Garga Muni who was the guru of the Yadavas (Krishna’s clan) had been there. Sri Shuka, the great boy sage, son of Vyasa had also meditated at the place known as Shuka Dev Ashram. The Skanda Purana calls Dunagiri as the Brahma Parvat or the divine mountain and refers to Dunagiri Devi as Harapriya or the beloved of Shiva. There are 108 Shakti Peeths in N. India. 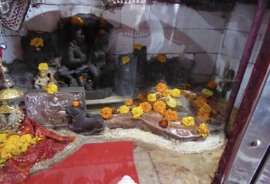 A shakti peeth is a place where the power of the goddess is most apparent. Dunagiri Devi is said to be one of the most powerful of the Sakthi Peeths in N. India. The goddess is the favorite of yogis. She grants nothing but liberation. 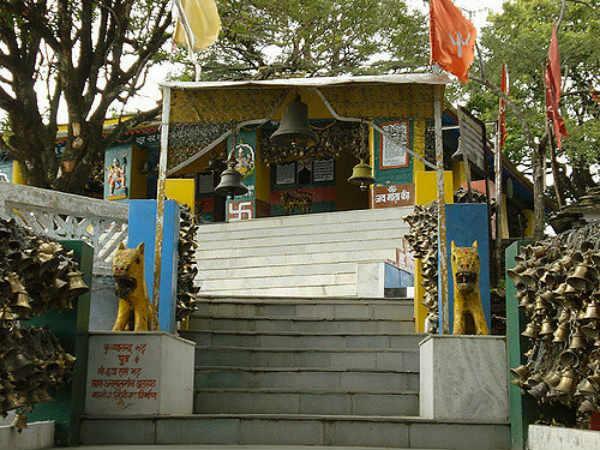 It is similar to the famous Vaishno Devi temple in Jammu since it has no proper figure. The goddess revealed herself through three “pindas” or mounds exactly as in Jammu. The whole hill is supposed to be filled with herbs of all sorts. Unfortunately nobody knows anything about this anymore. Baba Ramdev is supposed to have sent his assistant to this hill to gather herbs. As we have seen Hanuman had found the famous Sanjjivani herb at this place. The word “jiva” means “life” and the word “san” means “together. So the shakti or power of the goddess here is to bring to life, to revive, to give liberation, act as an antidote to death, offset all disease and so on. She is considered to be all powerful and attracts crowds of devotees. In fact the whole courtyard was filled with a group from Mumbai who had come with their Guru. We were not able to spend much time inside the shrine since there was a big crowd waiting to come in but after the crowd had gone we were able to go and sit there and examine all the interesting looking, ancient idols. The original Shakti Peeth was only the three pindas. The pindas couldn’t be seen since they had been covered by a red cloth. We sat and meditated in the yajnashala or place where yajnas are conducted since that was the only place which was a bit quiet. There were people everywhere unlike the Manila Devi temple. In fact the Mumbai group were all dancing and singing and making merry. At last they left and we were able to return and sit inside the sanctorum for a while. Obviously we had gone on a very auspicious day since a number of newly married couples had come to get the blessings of the goddess. 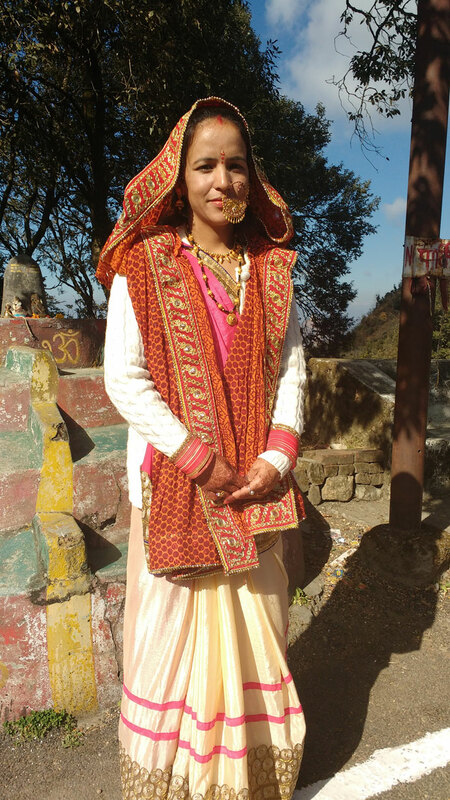 The girls of Kumaon are very beautiful and the brides wear the traditional bridal costume with intricate looking jewellery. Luckily they love being photographed so I was lucky to get a especially lovely bride. On the way down we came across a small shrine of Hanuman which looked very old. I was happy to see that Hanuman had been reinstated here after having been ignored for many years. 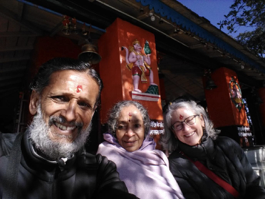 We were filled with joy and felt really blessed to have been given a chance to pray at this place which emanated such a powerful energy of the goddess and which was abounding with medicinal herbs. In fact someone told us to pick leaves off any bush while walking and eat it since it would definitely be some medicinal herb. I hope one day someone will come and identify these herbs and make them available to the common people.